Samford University’s Ethics Bowl team made its first-ever appearance and advanced as far as the quarterfinals at the Intercollegiate Ethics Bowl National Championship Tournament in Reston, Virginia. A few months before the tournament, 15 cases detailing ethical issues that have arisen in current events are released to competition participants. Teams then spend the next several months working with their coaches, discussing these cases, taking stances, practicing speeches and planning rebuttals. Samford faculty members Wilton Bunch, Mike Janas and Bryan Johnson served as coaches for Samford’s ethics bowl team. The national competition consisted of three preliminary rounds with the top eight teams advancing to the quarterfinals. Samford’s ethics bowl team went 3-0 in the preliminary elimination rounds, beating University of North Carolina–Chapel Hill, Sacred Heart University and Bowling Green State University. The team won each round by a significant margin, leaving them undefeated and leading the competition going into the quarterfinals, Johnson said. Topics Samford students discussed included the ethical dilemmas presented on issues such as animal rights, concussions in football, the use of automated cars and more. In the quarterfinals, the top eight teams competed in single-elimination rounds. Seeding for the quarterfinals was done at random, and the team from Samford was matched up against Whitworth University, whose team placed second last year. Samford lost a split decision by two points, making the round a close call, Johnson said. 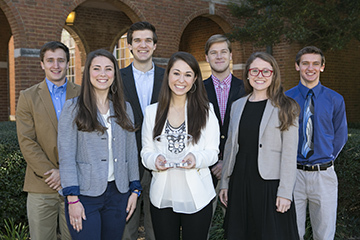 According to team member Elizabeth Poulos, judges told Samford’s team that the round was essentially a tie, and both teams deserved to be finalists for the excellent round of ethics presented. For Samford’s first time winning the Southeast Regional Intercollegiate Ethics Bowl and getting on the national stage, to finish tied for fifth in the nation was an outstanding end to an incredibly successful year, Poulous said. Team members are Bailey Bridgeman, sophomore English major from Colleyville, Texas; Stone Hendrickson, junior English and classics major from Edmond, Oklahoma; Jordan Holland, junior business major and Brock Scholar from Decatur, Alabama; Elizabeth Poulos, junior science and religion major from Fayetteville, North Carolina; Laura Ann Prickett, senior English and political science major from Decatur, Alabama; and Caleb Punt, junior religion and English major from Tavares, Florida. The Intercollegiate Ethics Bowl National Championship Tournament is sponsored by the Association for Practical and Professional Ethics.